Ohana Fine Events & Decor, Bangalore is a one-of-its-kind décor venture. It carries forward the legacy of expressing beautiful sentiments with lovely artisanal elements, designer props, eclectic accessories, dreamy lights, finest fabrics and of course, premium flowers. Whether it’s an exotic Moroccan wedding, an elegant, understated corporate brand launch, a vibrant sangeet ceremony, elegant cradle ceremony or an impromptu party, they can breathe magic into your ideas and bring them alive. You imagine. They create. Above all - with love and care. Ohana Fine Events & Decor, Bangalore would love to make your dreams come true with their exquisite blooms, exclusive concepts and attention to detail. B-25 b The Leela Galleria, The Leela Palace, Airport Road, Bangalore 560008. 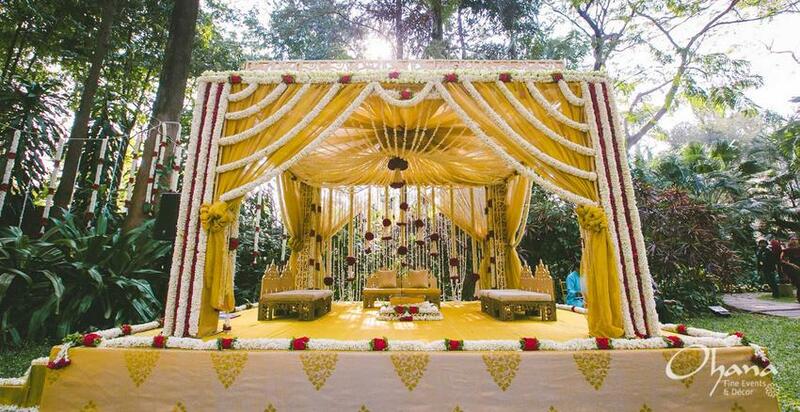 Ohana Fine Events & Decor is a wedding decorator based out of Old Airport Road, Bangalore . Ohana Fine Events & Decor's telephone number is 76-66-77-88-99, Ohana Fine Events & Decor website address is http://ohanafineevents.com, Facebook page is Ohana Fine Events & Decor and address is B-25 b The Leela Galleria, The Leela Palace, Airport Road, Bangalore 560008.. In terms of pricing Ohana Fine Events & Decor offers various packages starting at Rs 150000/-. There are 0 albums here at Weddingz -- suggest you have a look. Call weddingz.in to book Ohana Fine Events & Decor at guaranteed prices and with peace of mind. PRATHA WEDDINGS - A Tradition!